‘Tis the time of year when raspberries suddenly appear in significant numbers, materializing magically against the dominant green backdrop in every direction we turn. Sometimes they surprise us by showing up in a cluster of growth that we didn’t even realize included raspberry canes. 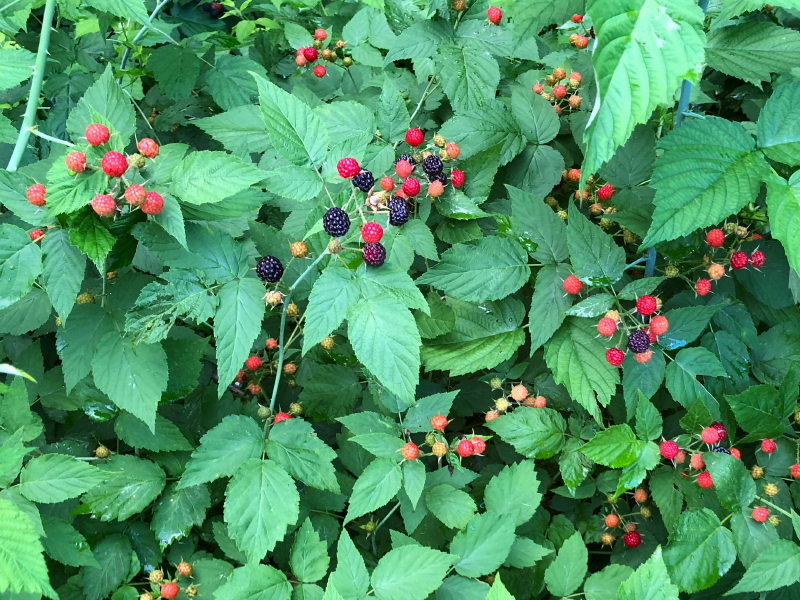 Cyndie has tried pruning some of our wild berry patches in the past, hoping to make it a little easier to walk through for picking berries, but the vigorous bushes seem to grow themselves into a solid mass again as soon as we turn our backs. Time to dig out the Ball jars with the two-piece metal lids in preparation of preserving the harvest. As is clearly visible in the image, we are lucky to be getting Black Cap Raspberries. I am not clever enough to successfully describe the flavor distinction between a red raspberry and a black cap, but after developing a taste for the unique flavor of the black caps, I have truly become a snob about the black cap supremacy. One of my absolute favorite treats is well-toasted New England Brown Bread spread with a layer of cream cheese and topped with Cyndie’s home-canned black cap jam. It’s an explosion of texture and unparalleled flavor that is pure culinary bliss. The first year she canned berries here, we gave the majority of jars away to friends and family before we realized the distinct difference of the black cap flavor. It was a minor disaster when we discovered there were no more jars of the preferred black cap jam left in the house for us. Now we know to hoard a secret stash of our own, separate from the stock that gets shared. Honestly, of all the different ways we have considered monetizing our activities here, Cyndie’s black cap jam is probably the most valuable. Too bad we aren’t willing to part with enough of that black gold to make that idea worthwhile. The yield looks bountiful this year. Something tells me I should be stocking up on loaves of brown bread, too.